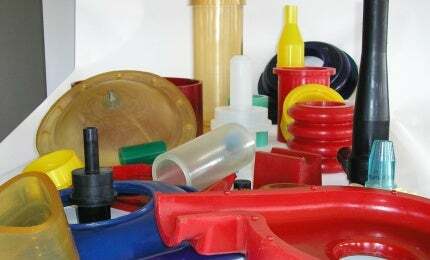 Politec manufactures high-performance mechanical parts and technical equipment, mainly using solid polyurethane. Polyurethanes are elastomers that have an excellent response to mechanical and chemical stresses, as well as a wide spectrum of beneficial mechanical properties. Politec’s knowledge of working with elastomers means that, with the correct formulation of reagents, it is possible to modify certain properties, increasing the performance of some elements while leaving others at a standard level. This flexibility makes Politec’s products suitable for a large variety of applications. Metallic and plastic inserts can be used inside the material to produce combined parts that have varied hardness levels (between 20SH A and 80SH D), as well as different mechanical properties. Through these options, Politec is able to offer products that increase the flexibility of applications. Politec offers customised mechanical parts tailored to meet customers’ individual requests. In order to provide the most suitable solution, Politec can test a material’s chemical resistance properties. Then, the company creates the best structural formula for products, ensuring they are highly resistant to hydrolysis in both acid and basic extreme strong solutions, and even several typologies of solvents, minerals and organic oil. Politec specialises in the construction of parts and elements for desulphurisation installations in thermoelectricals plants, supplying them with complete hydro-separators and coated pumps consisting of shellcasing, wear discs and rotors. The company also provides durable parts for operations in the mineral industry where the biggest challenges are abrasion and laceration, rather than hydrolysis in acid solutions. Politec is an expert in the construction of moulds and 100% polyurethane accessories, and supplies German companies that use isostatic presses for the production of refractory items. The technology used to manufacture compact thermosetting polyurethanes requires tapping the materials into the moulds after they have been heated in a furnace. Due to the nature of the process it is only suitable for parts up to a certain size. Contact Politec for more information or to discuss your component requirements.